Anti-embedment additive to the crude oil mass prevents production and flow stream restrictions due to produced water containing salts which can precipitate to form scale blockage. In addition the salts can accelerate corrosion. OilFlux™ “SBH” anti-embedment additive prevents embedment’s due to the crude oil mass containing crystalline salt formed due to pressure and temperature changes which strip water vapor as the crude oil mass flows up the extraction and production well casing. Embedment in the crude oil production and flow stream can require increases in pressure or temperature, which in turn can create other crude oil delivery operational problems and increase operational costs or slow down crude oil delivery. OilFlux™ “SBH” anti-embedment additive keeps the crude oil moving through the flows stream system without adverse consequences to equipment and downstream to the refinery without corrosion, fouling or catalyst degradation at the refinery. 1- Warren, K.W. 1993. 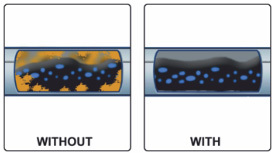 Reduction of Corrosion through Improvements in Desalting. Paper presented at the Benelux Refinery Symposium, Lanaken, Belgium, 2–3 December.